It’s another visit to Crytek. This time we’ll talk with Simon Fuchs, Senior Environment Artist who will tell us about asset creation in Crysis 2®. Mateusz: Hi, tell us something about you. Where did your passion come from? Simon: My name is Simon Fuchs, I am 29 years old and currently employed as a Senior Environment artist at Crytek Frankfurt. I have been working in the games industry for about seven and a half years now. I have always been very passionate about games and played pretty much anything I could get my hands on. This drove me to play around with Quakes Radiant Editor and Worldcraft for Half-Life which is what sparked my interest in 3d Modeling. I started out as a modder on several Half-Life mods back in the day creating weapons and small levels. These works later got me my first professional job as an intern at a small German company in Braunschweig called Nuclearvision, working on an FPS called Psychotoxic. M: Why did you choose to work in the games industry? S: I was always interested in how video games were made and wanted to create my own content for them. Once you understand the technical aspects, working in the games industry gives you a creative freedom that very few other jobs can offer. In addition, you´re always learning something new at the job and are constantly challenged to improve your skills. Be it learning a new modeling tool, creating workflow improvements or just teaching people who are new to the company, these are all things make the job so interesting. In the end if everything goes well you will have worked on a game that millions of people will play on a regular basis, which is really motivating. M: What are some of your responsibilities at Crytek? S: I am currently working as a Senior Environment Artist at Crytek Frankfurt. I’ve been with Crytek for about three and a half years now, primarily on the Crysis franchise but also helping out on other projects and technology improvements like breakability or shaders. We just shipped Crysis 2® and released the Crysis 2® Ultra Upgrade with additional DX11 features. During Crysis 2® my main responsibilities were creating environment assets and integrating breakability into the game, as a result I work with people from many different positions on a daily basis. For example, when it comes to the environment production, I talk with the Level Designers to make sure all of the assets I create work with their gameplay intentions. To ensure everything looks good and fits the theme of the game, I work with the Art Director and Concept Artists. Those guys help me to nail the look and feel of a scene and make sure that everything ties together in the end. Additionally, from time to time I train artists from Crytek’s other studios. I also work with various outsourcing teams who create assets for our games. I make sure everything goes according to schedule and to the highest possible quality.The more technical aspects of my job are working with the physics programmers to integrate all of the awesome breakability features and coming up with more efficient solutions for workflow issues or general art problems. M: What kind of modeling do you like most? S: I mainly focus on environment art creation since this is what I do on a daily basis. It means that I design and model various types of architectural, non organic structures. 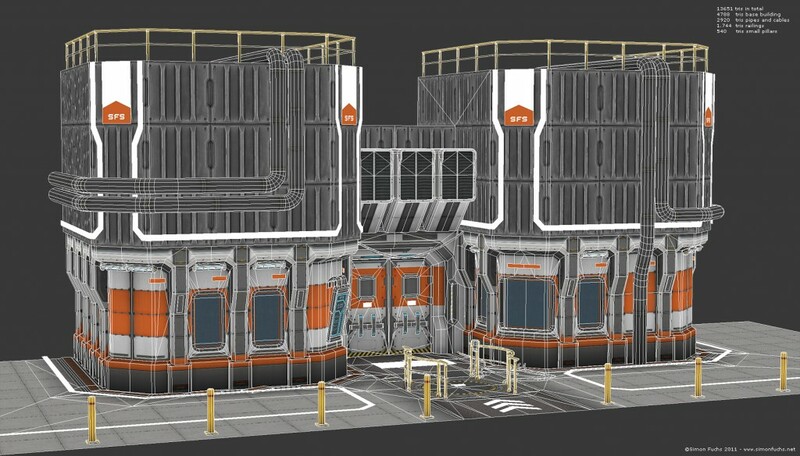 These could be interiors like carparks or hallways, big landmark buildings like Castle Clinton or just assets that are important for the gameplay like cover barriers or smaller props. I enjoy all of these steps involved in the asset creation process but highpoly modeling, adding details in Z-Brush and texturing are probably my favourite steps. M: How does your typical workflow look like? Can you walk us through the creation of a game asset from start to finish? S: The ideas for our levels come from the entire team. We usually brainstorm about awesome locations that would make the game fun and interesting first and then just do a list with all of these. Our Art Director (Magnus Labrant) then takes these ideas and refines them into a visual setting for the entire game. He comes up with the mood and the look and feel of the different environments. Level Design then creates a whitebox where they define the space and of the area we want to build. 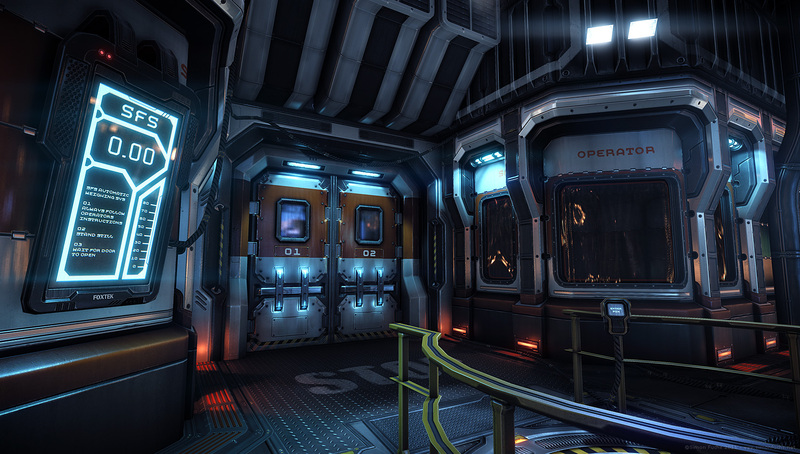 They begin roughing in the gameplay areas and add all objects that are relevant for it. They also block in the porportions of the gameplay spaces and the landmark assets of a level using solids, which are simple geometric objects like boxes, spheres or cylinders in CryEngine. The art team supports them with whitebox geometry as well so that they can populate their levels and don´t have to create everything from scratch. This step is extremely important as it will define the scope of the level, the gameplay experience and most of the art tasks later on in the project. If a whitebox level does not play well, no amount of great artwork will fix that and the core experience for the player will be disappointing. This is why we try to spend as much time as possible in this phase and iterate until everyone involved in the process is happy with it. If you mess up here you will have to fix all of these errors later on which is usually very time consuming since it will affect a lot of people. Once we are confident with how the level plays we pass on the whitebox geometry to the concept art team. They then do an overpaint of the scene and try to add all the visual details that make a scene interesting. According to the guidelines from Art Direction they will paint in the lighting, textures, colors and the general mood of the scene. Now my main work starts. I use the exported solids as a guideline for the proportions of my objects. I then go ahead and try to cut up these solids into modular pieces to be able to create the asset as efficiently as possible. Once I am happy with my modules I create the highpoly geometry using Sub-D modeling techniques in Max. I then export it to Zbrush and add the necessary details and weathering to make them look more realistic. I try to stick as close to the concept art as possible. Once I am happy with my geometry I bake it to my modules or to tiling textures. Now I export my modules and use the baked maps to texture them in Photoshop, using a combination of handpainting and photosourcing. In combination to the texturing I also setup all the relevant shaders in the CryEngine. We then do a final test of the asset with level design to make sure that the mesh works well with the gameplay mechanics and the enemy AI. After that, I build all the LOD´s, the final collision geometry, add breakability and add the technical setup. M: What is art management? S: Art management is the term that we use to define the more managerial tasks of the Senior Artists at Crytek. It is similar to the job of a Lead Artist but still closer to Art production. Every Senior Environment Artist at Crytek was a level art owner for at least one mission of Crysis 2®. For me this meant that I had to make sure that all of the assets that were used in the levels are scheduled and finished in time and to an acceptable quality level. I had to work with outsourcing studios, create briefings and give feedback and helped mentor the junior artists of the Frankfurt and Kiev team in order to bring their work to the next quality level. M: Crysis 2® is one of the first games using Direct X 11 and its features like tessalation. What does that mean for 3D artist? S: Being able to use tesselation on your meshes allows you to add so much more extra detail and really brings your mesh to life. You can add all of the small little dents that you would normally fake with a normal map, but you can now have them displayed as real geometry, in realtime. Things are looking a lot more realistic closeup since the displacement actually affects the silhouette of your model. When it comes to asset creation it, makes things a little bit more time consuming for the artist and the entire production overall. You should really create a highpoly mesh for every asset that you want to use with tesselation. The generated heightmap will look a lot better if baked from a highpoly then just generating it by converting your normalmaps. Using floating geometry on highpoly meshes becomes a bit more complicated, since you do have to adjust your values in your heightmaps later on to get the floaters to display correctly. It also requires you to keep a consistent geometry density in your lowpoly mesh so that the geometry displacement will be uniform across your surface. You have to avoid open edges in your lowpoly as well, since they will usually create gaps in your tesselated mesh. There are various other things that you have to keep in mind but these would probably be too technical for this interview. Besides tessellation, the Realtime Local Reflections were my favourite feature for the DX11 patch. It really adds that extra touch to glossy, reflective surfaces and just looks awesome in motion. The best thing about it is that it requires barely any additional art setup. The same goes for the Contact Shadows. S: The best part for me is working on large environment assets like City Hall, Castle Clinton or the Flatiron building in Crysis 2 from start to finish. It´s a great feeling when you create something from scratch and it ends up as a landmark asset in the final game. Solving all of the challenges on the way, from the whitebox mesh to the final asset is a really fun and motivating process that drives you to deliver amazing results especially when working with a team of dedicated and skilled co-workers. Training new artists is a lot of fun as well. It´s great to see someone progress from a beginner to an expert in a matter of years and you´ll always learn some nifty little tricks or techniques in the process yourself. I love meeting people from all over the world as well and there are many opportunities at Crytek to do so, since roughly forty percent of our staff are expats from all over. The worst parts of my job are the more monotonous and technical aspects that just need to be done to get the game to perform well on all systems. Creating LOD´s or cutting up your mesh for console limitations can sometimes be a bit tedious. M: Did you ever try working as a Level Designer or Level Artist? S: I started out as a level designer in the Modding community but quickly noticed that I was more interested in asset creation since it gave me a lot more artistic freedom. As a Senior Environment Artist you often do the job of a Level Artist as well and dress up some areas in the level or create smaller props to make sure everything fits together. I would say that being a Level Artist is a part of my job, too. In addition, we do have awesome dedicated Level Artists at Crytek. M: Do you think that it’s hard to find a job in the industry as an Environment Artist or3D Modeler? S: Currently there are many open positions for Environment Artists and 3D Artists since most bigger companies are looking to expand and games are getting bigger and bigger. It all comes down to how good you are and how much experience you have. It is always more difficult to find a job when you are just starting out or right after university but you just have to push yourself to the next level, be active in forums like polycount.com or mapcore.net or work on mod projects. You have to be willing to practice and put in the time to learn things. Always work on side projects and try to improve your workflow, get critique from industry experts and focus on learning something new with every project you work on. Crytek is currently hiring Environment Artists and Character Artists of all levels so feel free to drop me an email if you are interested. M: What is the best thing to put into your portfolio? S: The best portfolios I have seen are the ones that are tailored to the position that the artist is applying for. I like to see people specializing and really focusing on one area. If you want to be an environment artist, focus on props and environment scenes. Don’t add characters or weapons to your folio. Try to match the visual style of their games when applying for a specific company. If you want to work at Crytek, apply with a folio that matches the art style that we use in our games. The same goes for most other companies unless you want to be a freelancer. Another important thing is to only show your best work. I´d rather see a folio that has three really good pieces instead of a folio that contains all the work you have ever created but most of it is outdated and not representative anymore. The worst piece in your portfolio is always the one you will be judged by. 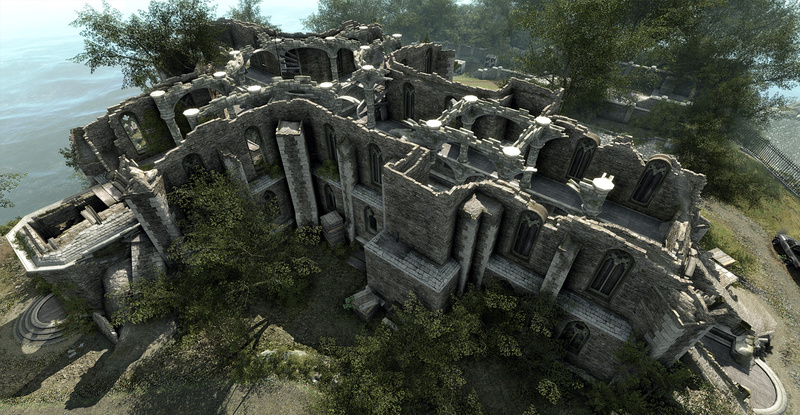 If you do not have enough material then focus on finishing one scene in a game engine like CryEngine 3 or UDK. This will help you get a foot in the door and companies can see that you know how to work in a production environment. Don´t add mental ray renderings of game assets to your portfolio, use a game engine to present your work! Look at other peoples portfolios and compare your work with theirs. Linkedin is a great resource to find lots of portfolios from industry professionals. Before applying, ask for critique in the forums I have already mentioned. Listen to feedback of people who are already employed and implement it before applying. M: What were the last games that you did play and which ones can you recommend? S: I like to play multiplayer shooter games like Call of Duty or Quake and strategy games like Starcraft II or Supreme Commander. I am currently playing Deus Ex: Human Revolution which is an awesome experience so far. I am only two hours into it so I have to wait with my final verdict but so far the reviews have been extremely positive. From an art point of view I recommend playing Gears of War 2, God of War 3, Killzone 3, Uncharted 2 and of course Crysis 2®. All of these games have amazing environments and do not disappoint when it comes to gameplay either. If you take time to look at the environments in those games and observe how textures, lights and models are used, you can definitely learn a few things. M: Where can our readers find you? S: You can find my portfolio at www.simonfuchs.net. Feel free to add me on LinkedIn, too. Thanks for the interview Mateusz!